Our Amish handcrafted Armoire Chest of Drawers has a unique look that is a mix between a traditional chest of drawers and an armoire. This Colonial style Armorie Chest is a timeless design that will remain popular through the years. The Old World Construction of the hardwood Armorie will bring a warm and inviting appearance to your bedroom. 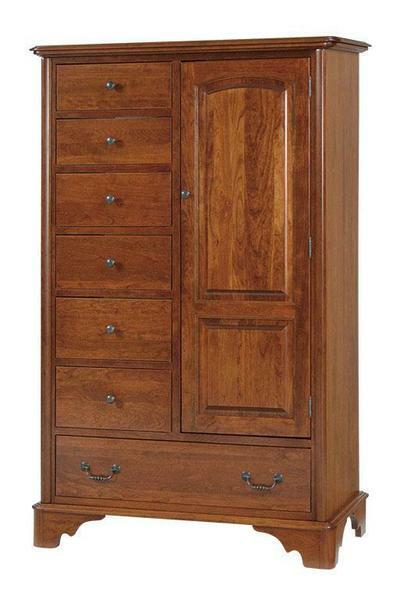 You will have plenty of room with this Amish bedroom furniture! Choose to have this handcrafted in your choice of Red Oak Wood or upgrade to our popular Cherry Wood. Custom woods and stains are available. Please call 1-866-272-6773 for a quote. This furniture can be customized as well. The drawers are dovetailed for years of use. The standard drawer slides are wood however full extension and soft closing features are also available. Dust covers are standard between the drawers.